Pictured is Columbia’s 4×100 meter relay team of Brandon Hall, Donavan Bieber, Ronnie Hunsaker and Tyler Hoguet, which qualified for the Class 2A state track meet. 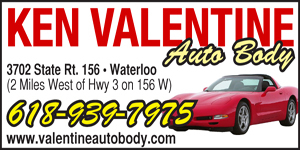 The Waterloo and Columbia boys high school track teams qualified athletes for the state meet taking place this weekend in Charleston by virtue of strong performances at the Class 2A Salem Sectional on Thursday. Those qualifying for state from Waterloo were Jackson McAlister, Jackson Ivers, Cayden Kirkham, the 4×800 relay team (Kirkham, McAlister, Adam Robson and Eli Ward), and wheelchair racer Donovan McBride. McAlister won the 400 meter run at Salem; Ivers placed second in the discus; Kirkham placed fifth in the 800 meter run; the 4×800 team placed second; McBride qualified in the 100, 200, 400 and 800 meter races. 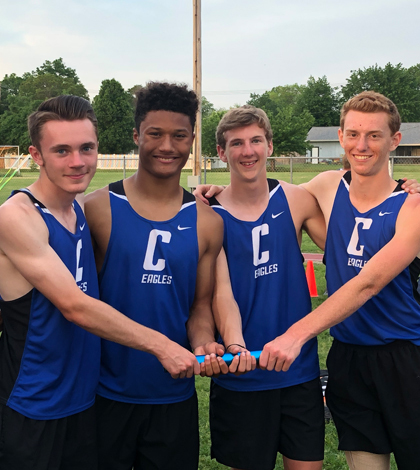 Columbia’s 4×100 meter relay team of Brandon Hall, Donavan Bieber, Ronnie Hunsaker and Tyler Hoguet also qualified for state with a school record time of 43.46 seconds for second place, which was just ahead of Cahokia. In the Class 1A Chester Sectional, Dupo’s Bryce Chadduck qualified for state by winning the discus.